This second release takes the listener on a journey through isolation, optimism, loneliness, triumph, and defeat. 2. Why Must I Be a Teenager Post-Rapture? The sparse instrumentation and striking verbal imagery found here calls to mind the chaos of oblivion, the melancholy of post-rapture adolescence, and the bliss of a leisurely afterlife spent on Mt. 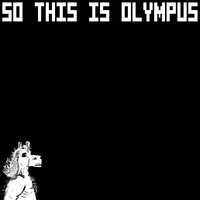 Olympus. "Agnostic Country Singer", arguably the EP's strongest single, and it's reprise are portraits of a man misunderstood by his lovers, family, and community. The title track is pure enthusiasm with lyrics that put Pegasus himself behind the mic. These songs serve to further blur the lines between the often caricatured mythical/historic figures from which the band takes their name and the achingly realist humanity the two icons have often portrayed. "Olympus" a departure from the group's debut release "Choose the Game", a full-length cd released in 2007, as it is an EP released exclusively to digital distributors. Fans may expect even shorter releases in the future, as DP singer/songwriter Barry Brinegar has expressed interest in releasing a string of singles once audiences have soaked up "Olympus".